Syracuse University Interim Vice Chancellor and Provost Liz Liddy today selected Karin Ruhlandt dean of the College of Arts and Sciences. Ruhlandt, who first joined the Syracuse faculty in 1993, has served as interim dean of the college since July 2014. “After conducting a lengthy and thorough national search, the search committee, the Chancellor, and faculty and staff in the college agreed—the best person for this dean position is already here in Syracuse,” says Liddy. “Karin is an accomplished educator, researcher and mentor who has a real passion for teaching and the liberal arts. 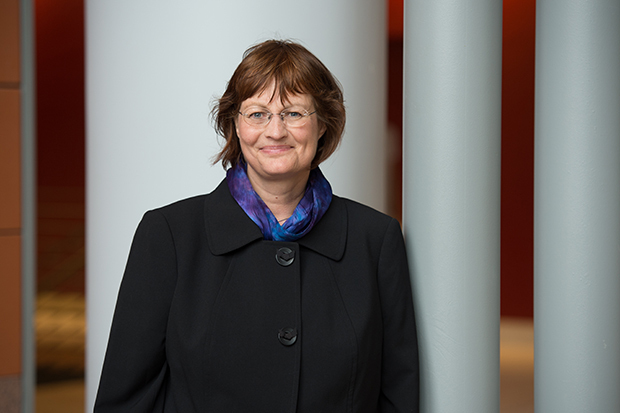 During her time as interim dean, Ruhlandt increased available funding for undergraduate research and reorganized how funds are distributed to ensure equity across all disciplines; reorganized the Syracuse University Humanities Center to enhance programing and support faculty scholarship; initiated collaborative relationships with leaders of the College of Engineering and Computer Science, the Maxwell School of Citizenship and Public Affairs and the School of Education to develop a number of new interdisciplinary programs; oversaw the development of a new career focus for undergraduate students and alumni, including high-quality academic and career advising; launched an aggressive communications strategy to improve editorial coverage of faculty, student and alumni accomplishments; and restructured the dean’s cabinet to operate more effectively and efficiently. Cavel Whyte ’15, a student in the College of Arts and Sciences and a member of the search committee, says being a part of the search committee allowed her to represent her peers and engage with faculty and staff across disciplines. “Communicating to others the importance of identifying a candidate that values transparency about the issues pertinent to the student body was crucial,” Whyte says. Ruhlandt was named chair of the Department of Chemistry in 2009; the same year, she was also named a Distinguished Professor, one of the highest honors for faculty whose exemplary leadership in teaching and research has advanced the University’s scholarly mission. A pioneering researcher in the area of alkaline earth metal chemistry, Ruhlandt helped establish what has become one of the largest National Science Foundation (NSF)-funded Research Experience for Undergraduates (REU) programs in the country, including a mutual summer research REU program with the Technical University in Graz, Austria. She has mentored more than 20 doctoral candidates in her laboratory, several postdoctoral fellows, visiting faculty and more than 100 master’s and undergraduate students, many of whom moved into highly successful careers in industry and academia. As a passionate teacher and researcher, Ruhlandt has made significant contributions to the emerging field of alkaline earth metal chemistry, an area of research that is exploring ways to use highly reactive metals (calcium, strontium and barium) to create new materials for the biomedical and high-tech industries. These metals are challenging to work with in the laboratory because they cannot be exposed to air or water without decomposition. Ruhlandt’s research group is among a select group of university-based researchers worldwide who have laid the experimental foundation that now enables scientists to study these metals in ways that were not possible a little more than a decade ago. In 1997, Ruhlandt received an NSF Career Award for her groundbreaking research. More recently, she received a prestigious NSF Special Creativity Award, which enables creative investigators an extended opportunity to attack adventurous, high-risk research pursuits. Ruhlandt is the author or co-author of more than 150 scholarly publications and book chapters, has presented lectures and papers at conferences and universities worldwide, is a reviewer for national and international granting agencies and numerous scientific journals, and has participated on a number of University committees and panels. Ruhlandt received the Chancellor’s Citation for Excellence in 2012 and a Fulbright Fellowship in 2013, enabling her to spend a year at the Technical University of Graz (Austria). A native of Germany, Ruhlandt holds a Ph.D. from Philipps-Universität Marburg and was a postdoctoral fellow at the University of California, Davis, which is where she also conducted most of the experimental work for her doctorate. In 2003, she was a visiting professor at the University of Auckland, New Zealand, and at Monash University, Australia. Karin Ruhlandt announced as Dean of College of Arts and Sciences from Syracuse University News on Vimeo.